Low voltage or high voltage, inside wiring or traffic signalization, industrial or institutional – electrical contractors offer a wide range of services. With professionals in Underwriting, Claim and Risk Control all dedicated to your industry, we can tailor an insurance program to fully support your risk needs with the right products and services. We have specialized products that provide limited coverage for physical injury to certain electrical property to help electrical contractors like you manage the unique risks you face. Local markets may serve you locally, but not when you grow or work outside of your area. 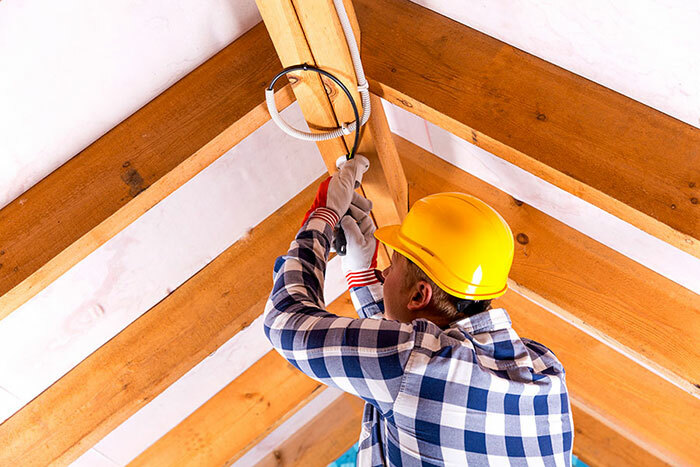 Brittain Insurance Services local presence but national scope serves multi-state and local electrical contractors with experience and expertise that translates to a better understanding of what you do no matter where the work is performed. Our broad, tailored coverages and enhancements are based on our deep knowledge and experience in the construction industry, and specifically designed to meet the needs of our customers. We want to protect you and your employees after a work-related injury or illness. For the injured employee, workers compensation provides medical care, lost wages and more. For the employer, workers compensation provides a sole remedy, avoiding expensive civil litigation, plus peace of mind knowing your employees will get the help they need to recover and return to work. Most importantly, we help mitigate losses to avoid large increases in your experience modification. Provides protection against liability for bodily injury and property damage to others caused by the maintenance or use, including loading and unloading, of your company-owned autos. Provides protection, as required by applicable state law, to the insured for damages sustained by the insured that result from an accident caused by an uninsured motorist. Covers your contractor equipment and material that is mobile in nature or requires unique valuation. Coverage extends to property that is owned or in a business’ care related to construction, transportation, fine art and renewable energy. If you own your building/office or rent it, we have property coverage that protects you. From buildings to equipment, your commercial property is vital to your business. So is protecting them from a wide variety of unplanned risks. Because one size does not fit all, our flexible property insurance policies are designed to meet your unique needs – covering buildings, personal property and time element exposures. With years of hands-on expertise, you can count on Brittain to deliver cost-efficient, tailored property insurance solutions. What type of Electrical Contractor do we cover?